The worst part about travelling is moving between locations. Packing everything up and lugging it all to the airport/train station/bus stop. More than likely more than one form of transport is required. 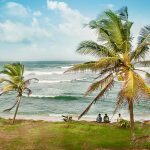 The relief of arrival in a new town is short lived as the task then becomes one of finding the location of the pre-booked accommodation. There is again the struggle with an unfamiliar public transport system, and possibly a foreign language too. Check out times usually don’t match with check in times, so maybe now there is a wait before being rid of the luggage so exploring can begin. As we left Naples for Florence this was all made a little harder for us. 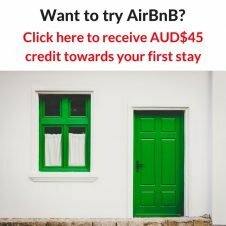 We had contacted our upcoming AirBnB host through the official channels but were yet to receive confirmation that we would be met at the required time. 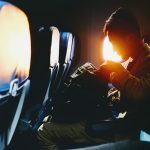 Simon then sent a text – to receive a text back saying they did not have our booking. A call to AirBnB assured us that we DID have a booking, and not to worry, they would contact the host. If we couldn’t stay there, they would find us somewhere else! Big sigh of relief! Except – we then get a call back from AirBnB saying so sorry, the place is booked and we can’t find you anything else! Here’s some extra credit, but you will have to find your own place to stay! By this time we were boarding our train. Another fabulous fast train that was going to whisk us to the other end of the country in three hours and for under €30. And it had wifi! It took us two hours to find somewhere to stay in Florence for the next two nights! There was simply nothing in our budget anywhere near the city centre available. At least when we arrived we had somewhere to go. 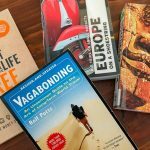 Travelling is like this. It doesn’t always go smoothly, and it’s the most stressful parts that tend to go wrong. The control freak in me gets a little upset, but I am getting better at realising it’s beyond my control. The worst that can happen is we completely blow our budget, since there’s always another flight, more places to stay, but at a cost! We just eat more frugally, or book a really cheap place next time. Worst case – we go home early! Ummm, back on track, what was I meant to be talking about? 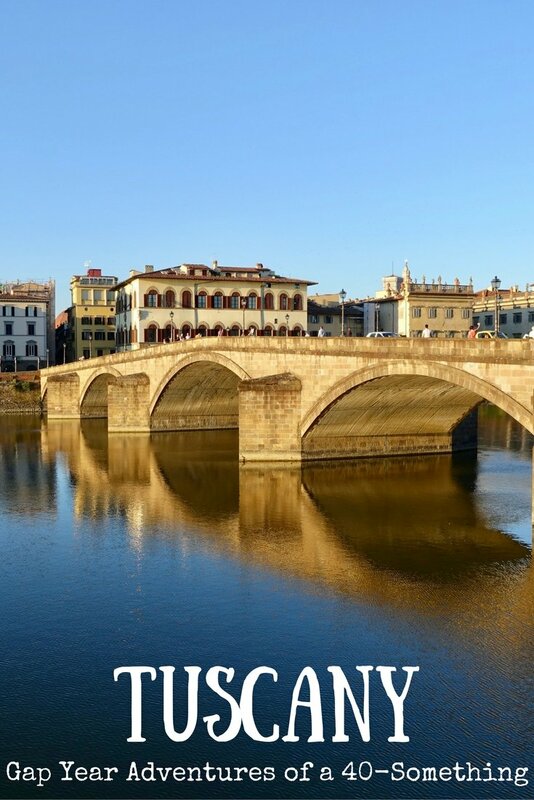 Oh yes, Florence! We settled in before heading off into the city to look around and grab some dinner. Simon was navigating and we just “happened” to stumble across the Hard Rock Cafe. Conveniently it also “happened” to be happy hour, so I was bribed with half price cocktails and nachos. For €20 ($30AUD) we each had a Long Island Ice Tea and stuffed ourselves with nachos! A cheap dinner to make up for the extra spent on our room, and Simon got his HRC fix! 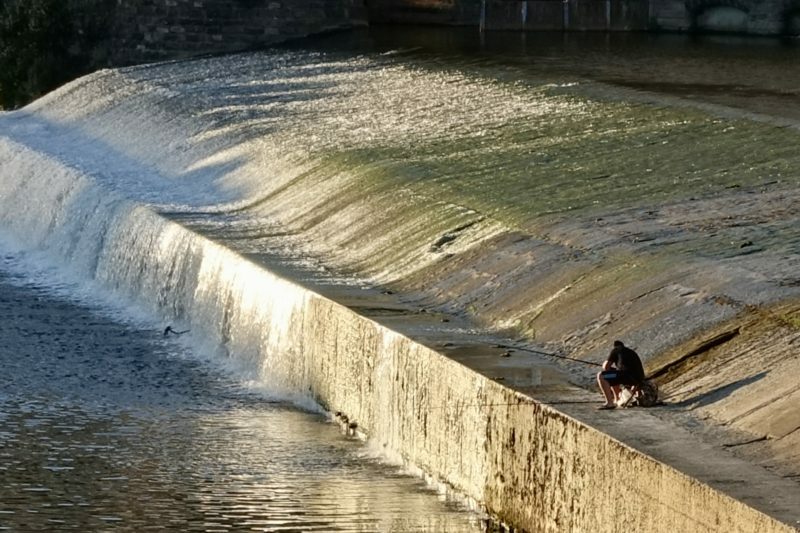 We walked back as the sun was setting, showing off the colours of the Arno River. The next morning we stayed in – mostly to do some washing, but also to catch up with some work, figure out what our plans were going to be for the next week or so and book some accomodation. Where we were staying had a great little courtyard that made the perfect place to relax. Even better, the employees kept us supplied with coffee, even after the usual breakfast time had passed. Another late afternoon walk showed us more of the city, with pizza, wine and of course gelato for dinner in one of the piazzas, just soaking up the atmosphere. 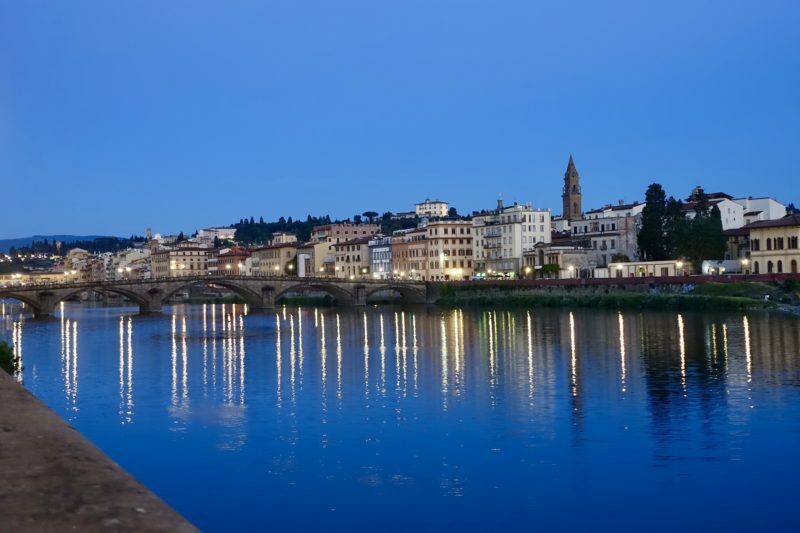 Day three in Florence saw us move accommodation to the Hilton Florence Metropole. Simon is a gold Hilton member, and to keep this we have to do twenty stays in Hilton properties in the next year. Therefore when we see the opportunity to stay a night or two for a very good price, we will. We also get an upgrade and breakfast, and if there is an executive lounge, we can normally turn the evening nibbles into dinner, so it can be quite cost effective in the end. It was early when we arrived at the Hilton, and were given an early checkin. We had planned to spend the rest of the day exploring the area, knowing we were further out of town now. Well, that took us all of an hour, and it included the worst lunch we’ve had in weeks. We would just have to figure out how to spend our time in the Hilton instead. After an hour in the whirlpool, we retired to the exec lounge for coffee, cake and biscuits, and a bit more work. This became our place for the rest of the evening. I only left when kicked out at closing time. 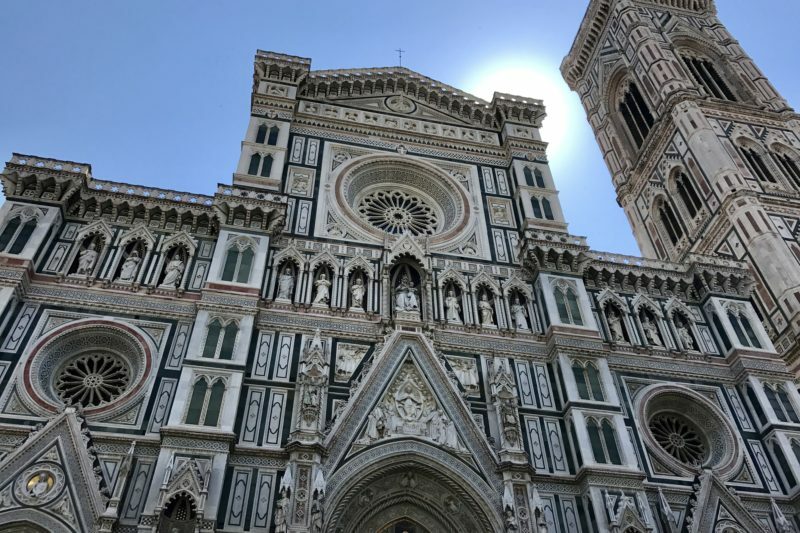 The Hilton was lovely, but we still had things we wanted to do in the centre of Florence, so we took advantage of the free shuttle provided the next morning. After hunting down a particular puzzle ring for Bailey, we made our way to the Galleria dell’Academia to see, amongst other things, Michelangelo’s David. On seeing the two hour line we decided we couldn’t wait that long again. 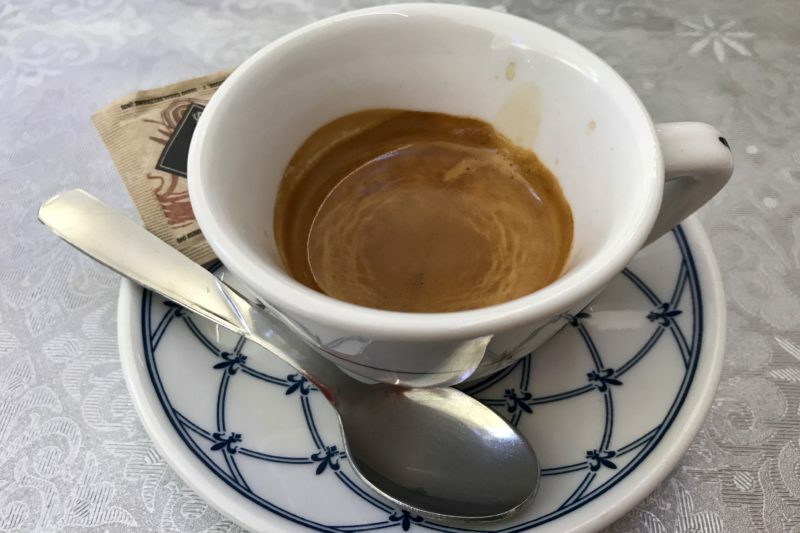 Instead we went and got coffee – my first, real Italian espresso. But not my last! It was late afternoon when we got the shuttle back to the hotel. We soon made our way back to the exec lounge. 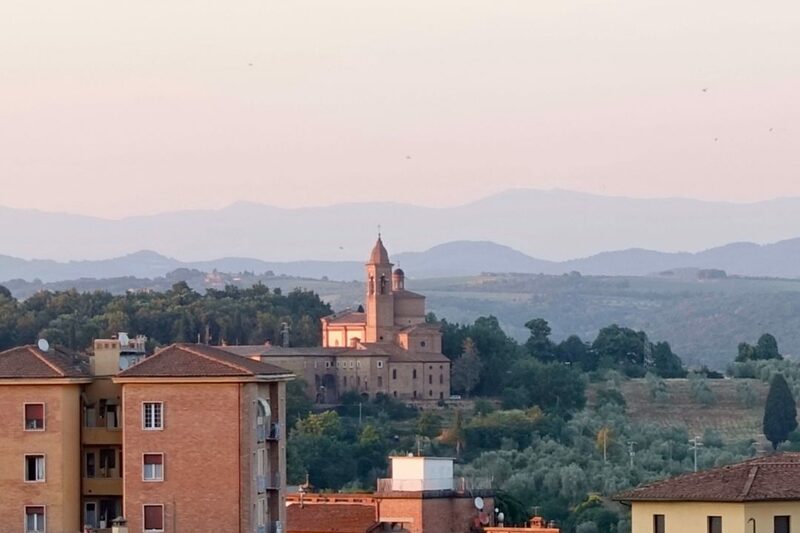 We spent the evening talking with a lovely couple from England, and soon we had made plans to join them the next day as we were all going to Siena. Before Siena, our first stop was at the Florence American Cemetery and Memorial. 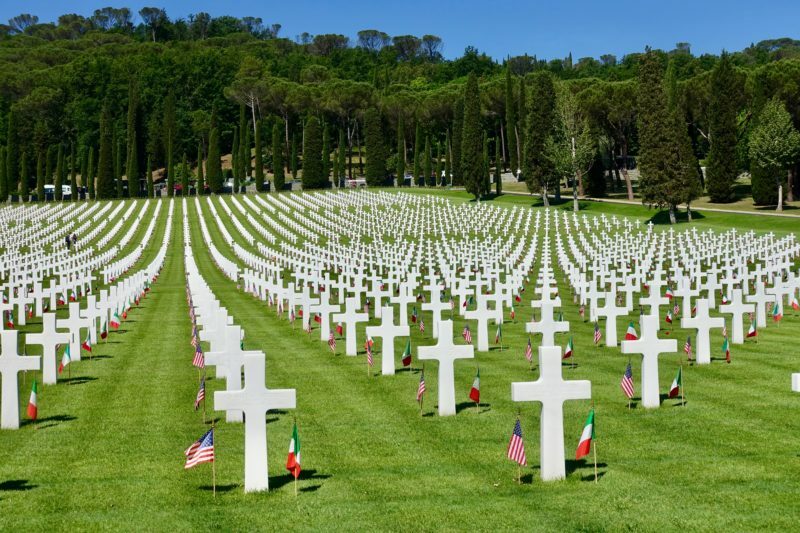 In the USA it was Memorial Day, and a special service was taking place to recognise American soldiers who had served – and some died – in Italy. Nick and Claire had been there the day before, and as ex-military they had been invited back to watch the service. We just tagged along. One section of the Florence American Cemetery. 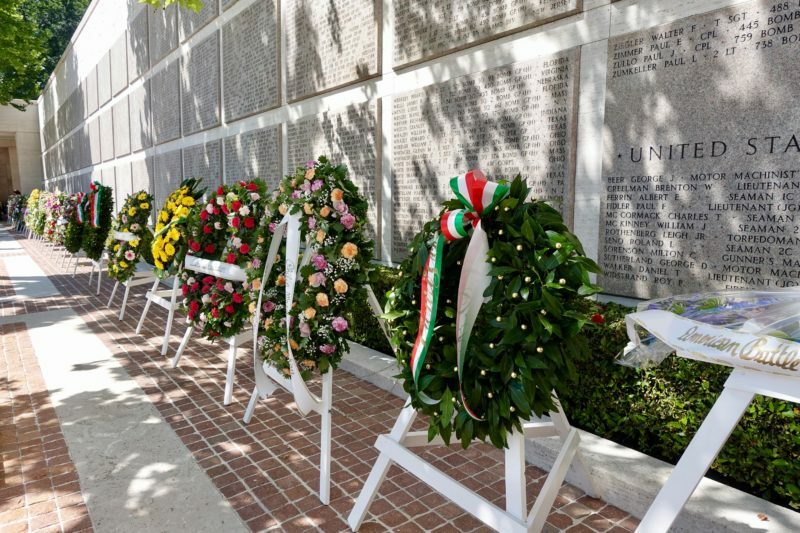 Wreaths in front of the list of men and women who were missing presumed dead, and therefore not buried. 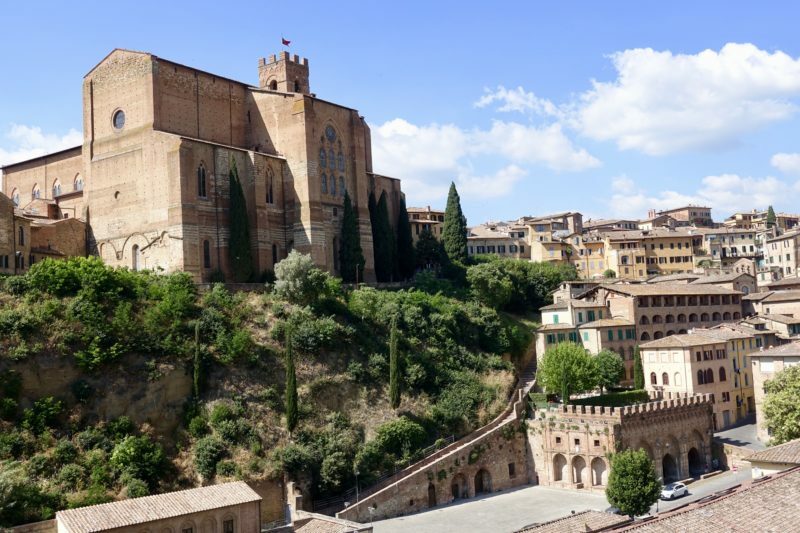 Nick and Claire had a hire car, and as we arrived in Siena sought out the nearest carpark. It was only 850m to our accomodation, so walking with our backpacks was not an issue – or at least it wouldn’t have been if it wasn’t all seriously uphill! Google Maps needs an option to show change in altitude as well as distance! We arrived at our B&B ten minutes early, but even though we had instructions how to enter if the hosts weren’t home, we couldn’t get in. This is becoming a bit of a theme on this trip! We waited ten minutes, and at exactly the time we said we would arrived, the B&B owner arrived, and let us in. 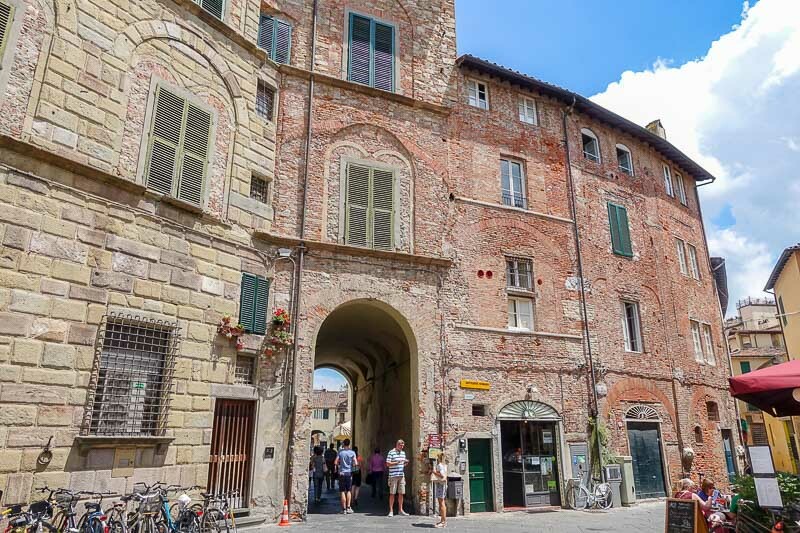 We spent three nights in Siena. 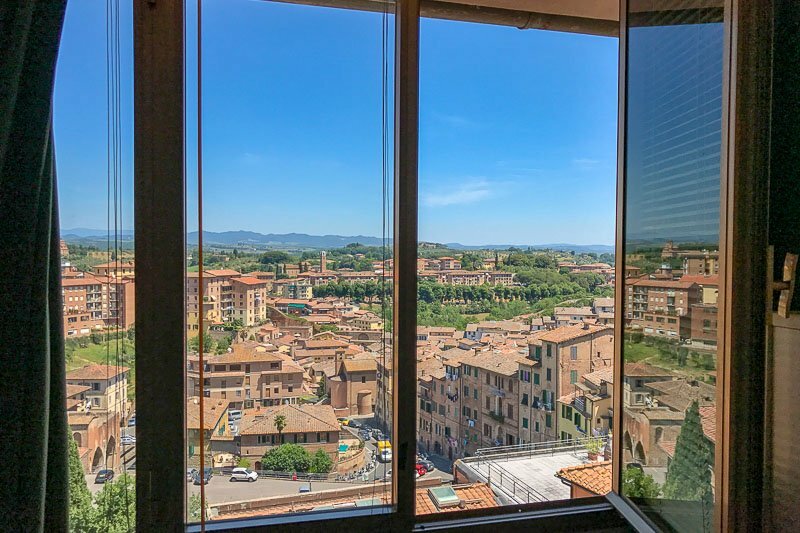 The view from the window of our room was stunning, and with the windows open and the breeze coming in it was so relaxing and the perfect place to work. 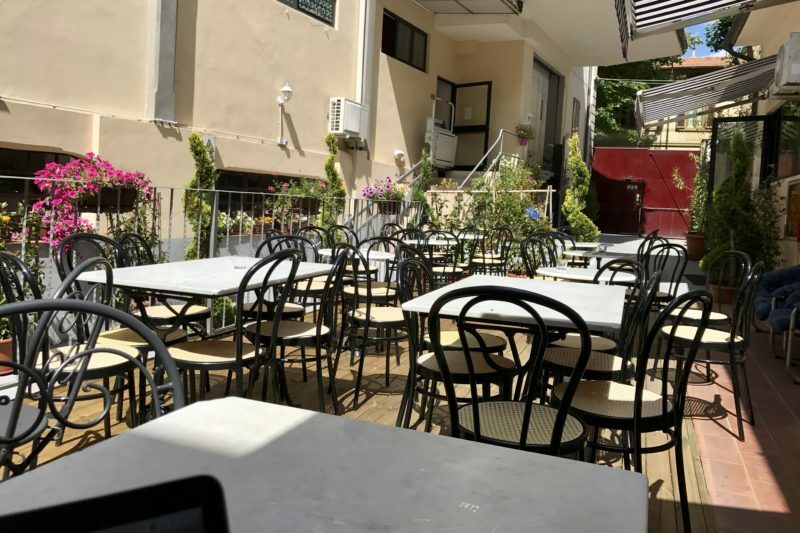 Each day we would venture out in the morning for a couple of hours, and once the sun started to beat down early in the afternoon, we would retreat to our haven to work, rest, and enjoy the view, before heading out again in the evening for dinner. 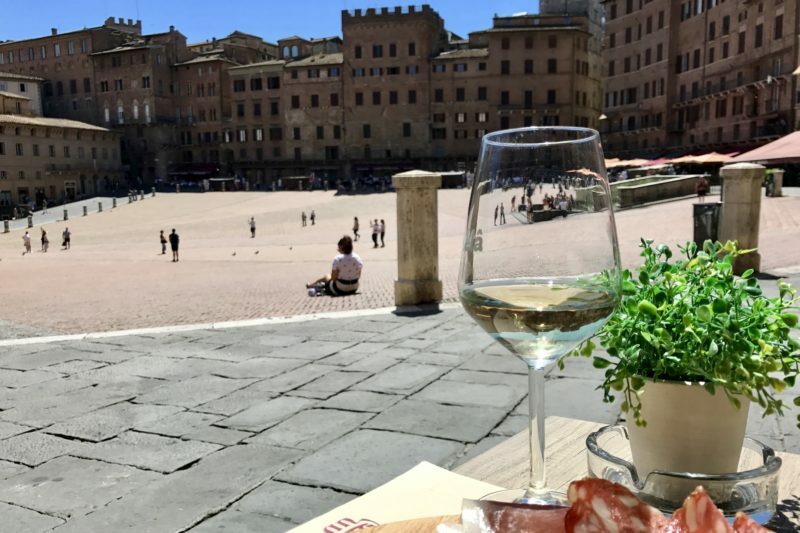 We spent nearly every meal, coffee and apertivo break sitting around the main square of Siena enjoying the atmosphere. We didn’t do a whole lot except wander the streets during our stay, but if you are looking for things to do in Siena, I will be doing a blog post on that soon. From Siena we moved on to Pisa. 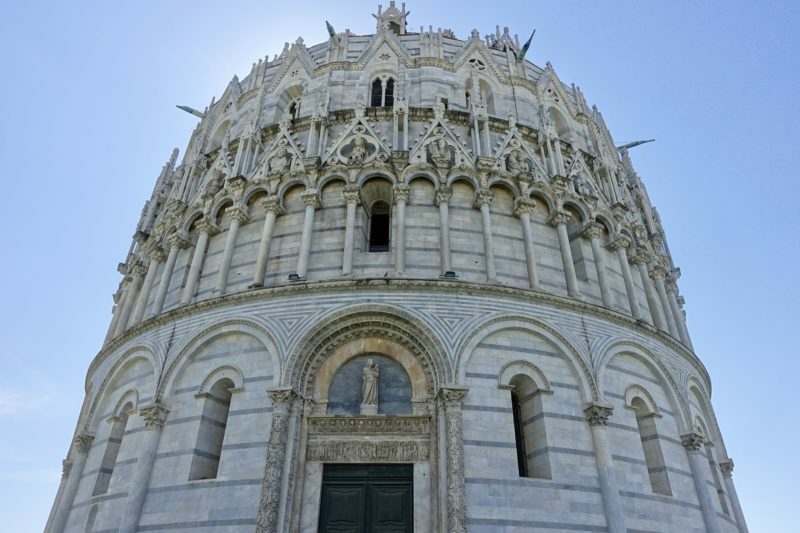 I had mostly heard that there was not much to see in Pisa, and we could have done it as a day trip from various other places, but as we had to travel through it to get to our next destination, we decided to stop for a night. We booked what was probably our cheapest accommodation yet and jumped on a train. We checked in, and immediately went back out in search of the reason we had come here – to take that silly picture holding up the tower! We arrived at the Leaning Tower of Pisa at about 2pm. For a change it was a nice sunny day, without being too hot. The tower was a bright white, standing out against the brilliant blue sky. 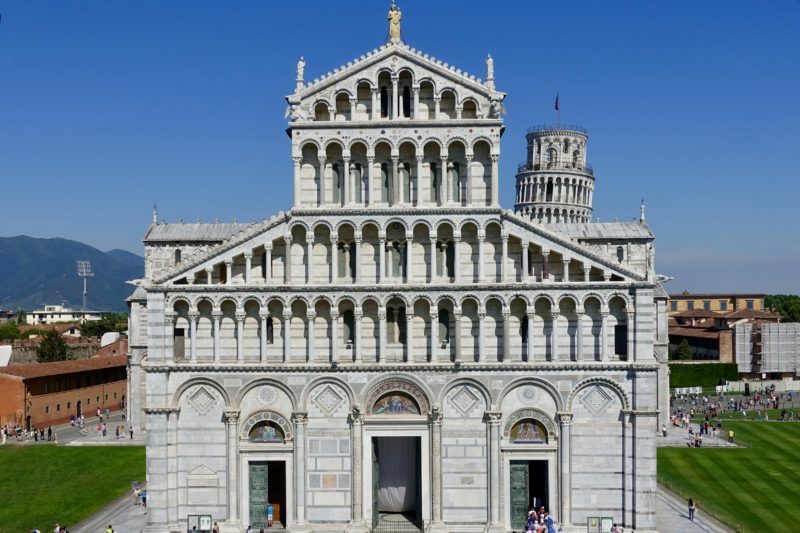 The area around the tower also contains the Pisa Cathedral and Bapistry, as well as some museums on either side. There are large expanses of beautiful green lawn, something we have not seen much of in Italy. There are even certain areas of lawn where it is possible to sit back and relax. How the Tower is still standing really is amazing – or in fact, a great feat of engineering. It has been sinking since the 1100’s and is still doing so today. I wonder how much longer it can continue to stay upright? We didn’t climb the tower, even though you can if you want to. They only let 40 people in at a time though, so it can be a wait. Instead we bought a combined ticket to see the other four buildings around the area, and spent the next couple of hours looking around them. 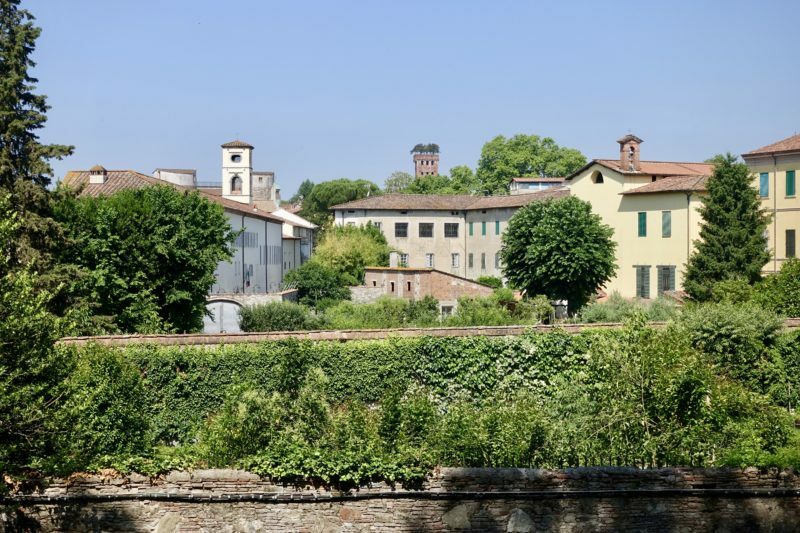 The next day we were off up the road – or train track to be more precise – to Lucca. I immediately liked Lucca. It is an old walled city, and all the walls enclosing the old town are still in tact. I was a little upset the moat is no longer full of water, because that would have been so cool! Our entry to the city from the train station was through a small gate in the walls of the town. The apartment we stayed at was just outside of the walls, but it was absolutely fantastic. We were the first guests the owners had in there since they’ve changed it to a short term rental place, so we were met by the owners as well as the property manager. 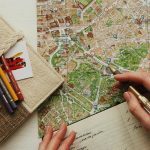 They went through everything you could imagine and more, showing us all the ins and the outs of the apartment, telling us where all the local places to eat and shop were, and making suggestions for things to do. They even left us a welcome basket, with fruit, wine, jams, honey, sweets etc. 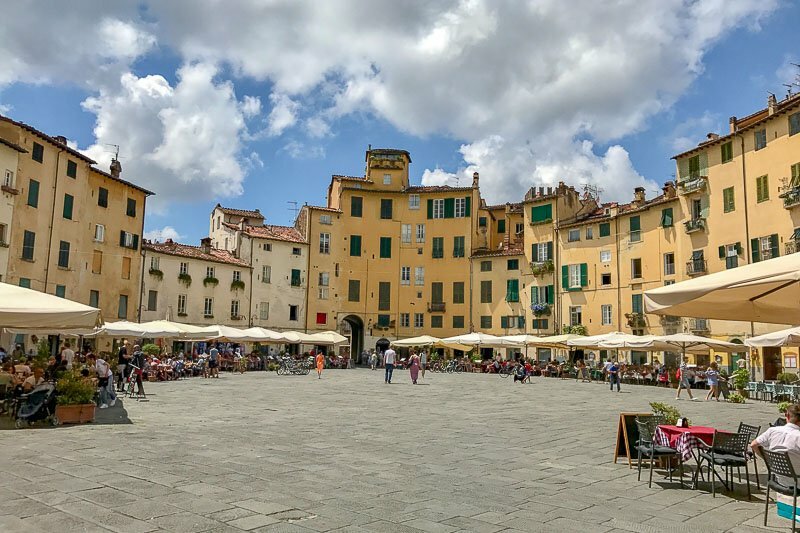 If you are looking for a place in Lucca, we highly recommend it. The link for where we stayed is at the bottom of this post. The apartment was just so relaxing I could have spent the whole three days there without leaving, but we thought we probably should check out the town too. To get our bearings we went for a walk around the town on top of the walls. My research told me it was four kilometres and should take around an hour to walk around. We took nearly three, but we did detour off the walls a couple of times to look at some other things close by. 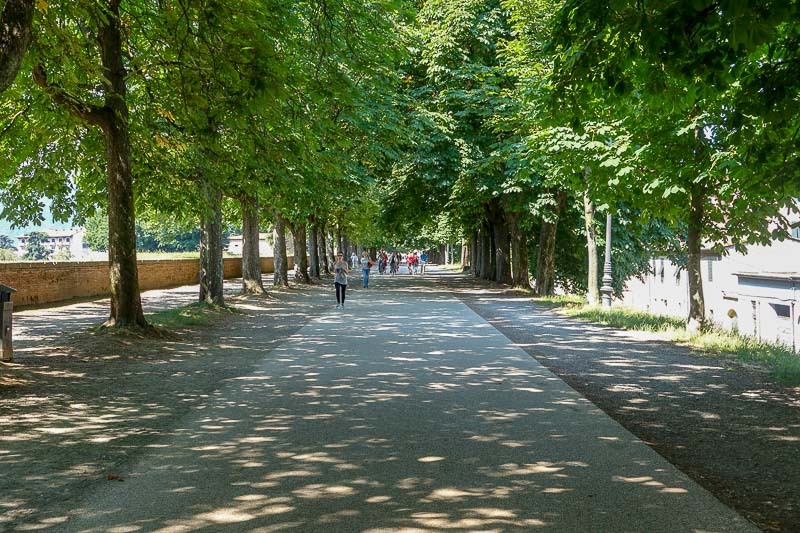 My favourite thing about Lucca was that it was green. I had found that there just don’t seem to be a lot of open green spaces in Italy. I had come across very few parks or playgrounds or even sports grounds that I am so used to seeing in Australia. It was nice to have park areas on top of the walls, with seating and playgrounds for the kids. 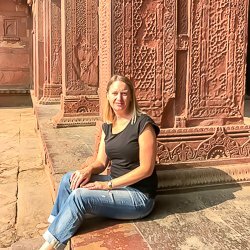 It was mid morning when we started our walk, and while not crowded, the walls were being well utilised, by both locals and visitors alike. As it got towards midday, there were many more visitors on bikes (particularly those four-wheeled bikes where whole groups can peddle together) doing the lap around the town. The green of Lucca. Notice. the tower in the middle with trees growing on it. The walkway on top of the wall is nicely shaded, making it a pleasant place. We went home via a supermarket to pick up ingredients for dinner. We knew we had every possible utensil and appliance in our apartment, so could have something a little better than pasta and ready made sauce. On arrival back at our apartment, another bottle of wine had been left by our host as an apology for a small issue with the washing machine the day before. We almost hoped for a few more small inconveniences if this was what we got in return. 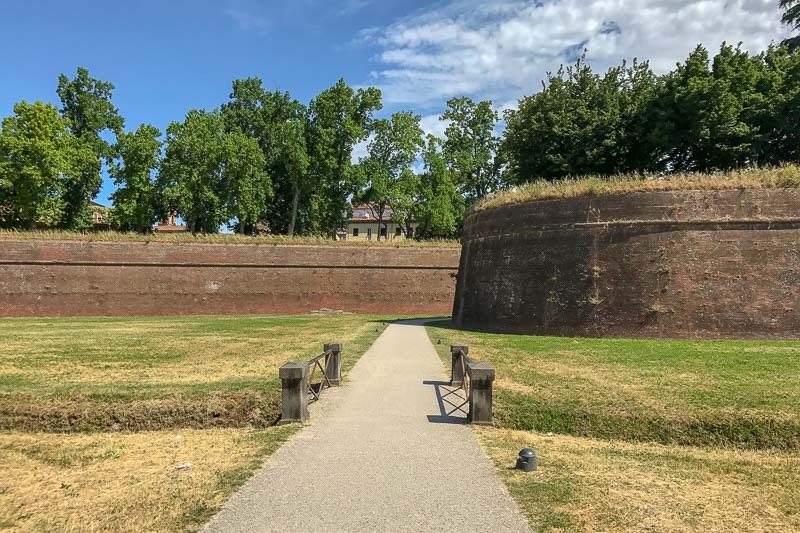 On our last day in Lucca – and Tuscany – we thought we should go and look at a museum. We had become a little museum’d out and nothing was really taking our fancy. I had come across the Torture Museum, and thought that at least that would be a bit different. Well, it sure was! 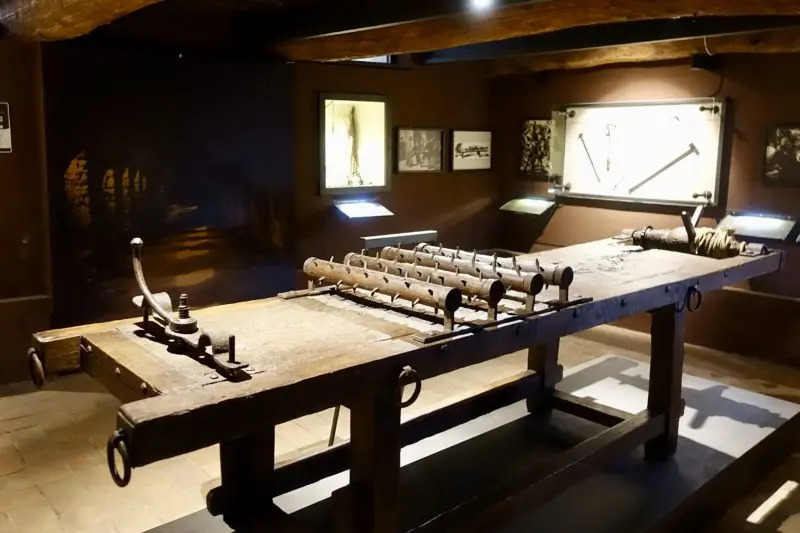 It was quite small, and displayed various instruments of torture throughout the years. They even have an original rack! While it all looked quite tame, it was the descriptions that had me feeling a little queasy by the time we left. I am not a queasy person normally, so I was surprised. This doesn’t look like fun! The rack. This one had the special addition of spikes to go under the back to make it just a bit more uncomfortable! The rest of the day was spent looking around the town. 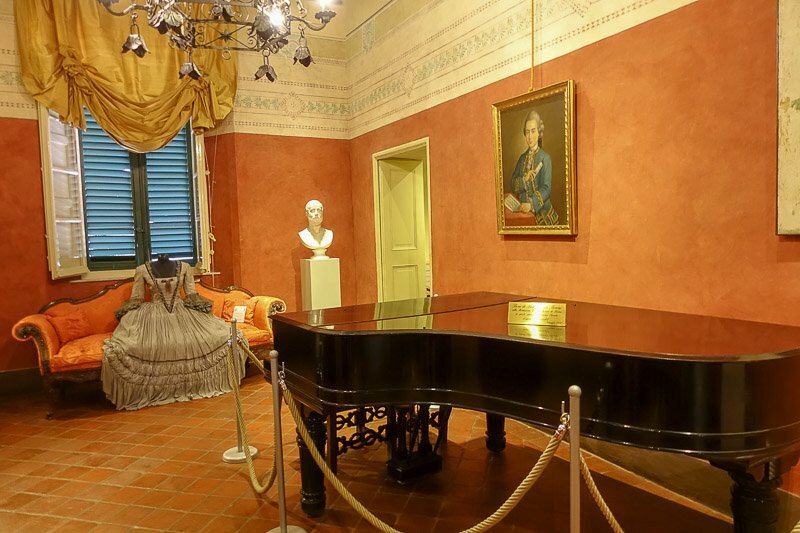 There was a quick visit to the house Puccini lived in which has now been turned into a museum. 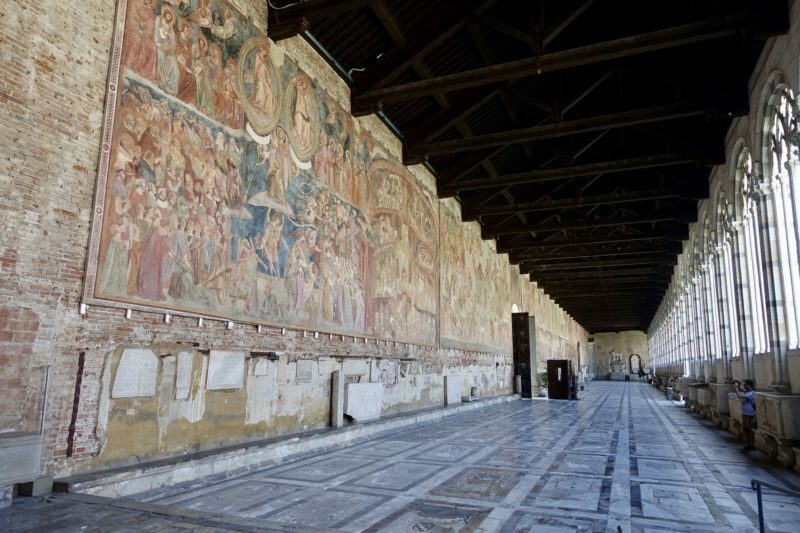 We checked out the anfiteatro, went into a couple of churches, ate gelato, tried brigidino and bought some buccellato for later. We also wanted to try the other local specialties of cecina and necci, but that will have to wait until next time as the shop that sells them was closed on Sunday. From the outside. There are a couple of areas where the shape of the anfitheatro can still be seen. Inside the anfiteatro. Looks a bit different to what it would have been back in the day. Late in the day we finally came across a tower I had seen a few times during our walk the day before around the city walls. There were trees growing out the top of it! It was possible to climb to the top, but it was time for dinner and our stomachs won. The beauty of your opening shot grabbed me. Lovely pastel colours of Tuscany. Don’t tell me you got that from your little matchbox of a point-and-shoot? 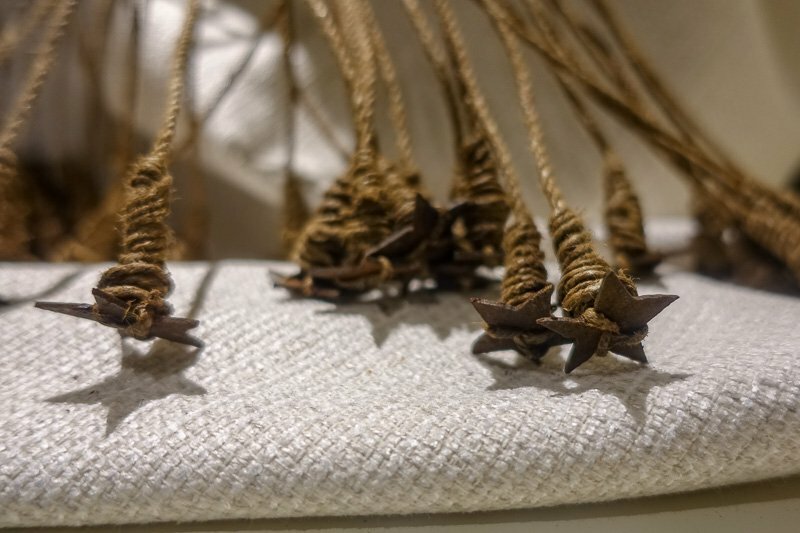 Sounds like most problems can be soothed away with a bit of wine and coffee, and Italy is certainly the place for that. Not sure about the grappa. Something to fuel the Vespa with rather than put in your mouth for pleasure. You must be building up some serious fitness, trudging up and down hills and towers. As the weather warms up, you may discover your spare Euro disappearing into the gelato stands. Yum. Hahaha, yes Pete, that shot was from my matchbox. Full zoom too! Not normally when I get the best photos, but this one isn’t bad! 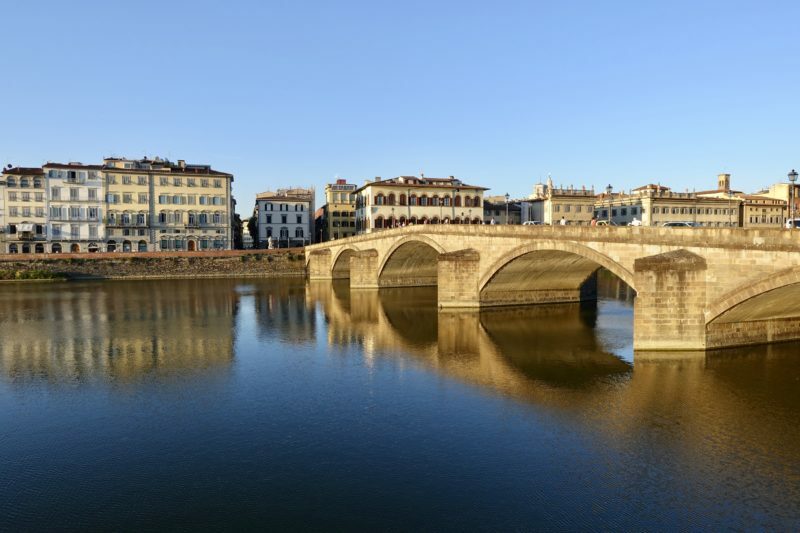 Loved the first shot of the Bridge over the Arno River .. gorgeous reflection. 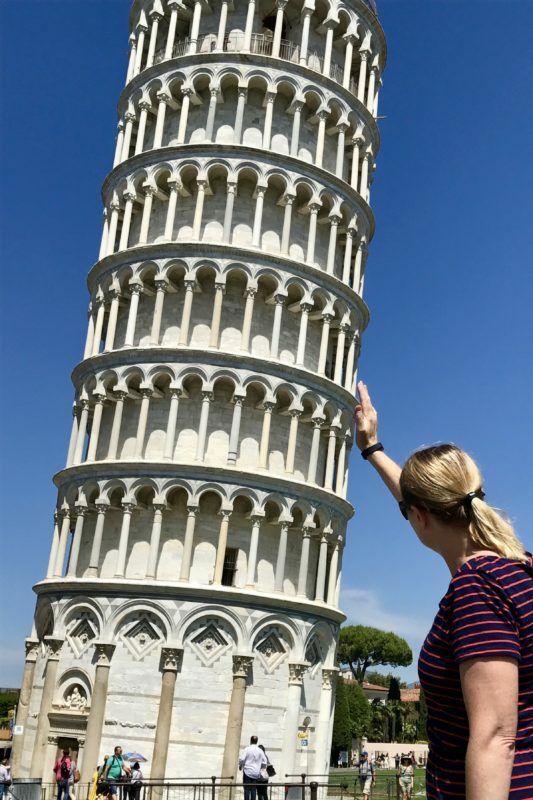 And great capture of you holding up the Leaning Tower. Tuscany countryside reminded me of McLaren Vale .. very pretty. You are right! It is a lot like McLaren Vale. We could see the vines and fruit trees growing over the hills.